Chick lit meets the Taliban in The Little Coffee Shop of Kabul (also published under the title A Cup of Friendship). This unlikely pairing creates a warm-hearted read with a serious message about the treatment of women in modern day Afghanistan. It tells the story of five women – two Americans, one British and two Afghans – and the friendship they forge in a little coffee shop in the centre of Kabul. It’s evident that American author Deborah Rodriguez loves Kabul, the city she called home for five years during the 2000s, and that she has a lot of respect and compassion for its people. I like what she has done with The Little Coffee Shop of Kabul. She gives us an insight into the lure of a country like Afghanistan for foreigners, the harsh realities of life for Afghan women and the struggles of the older generation who can remember life before the Taliban. She also gave me a greater appreciation for the people of Afghanistan and their country, culture and traditions. She does so using a writing style that is very easy to read. I didn’t love this book, but I liked it a lot. It’s not as haunting as Khaled Hosseini’s A Thousand Splendid Suns, but there are similarities between the two. Both authors draw attention to violence against women in Afghanistan, albeit using different genres. If you’re looking for a an easy and warm-hearted read that gives an insight into the struggles of women living in a country with a culture that is far different to ours, then The Little Coffee Shop of Kabul is worth a read. As I was reading The Little Coffee Shop of Kabul I became quite intrigued to learn more about its author. 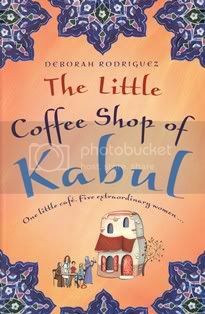 This is the second book by Deborah Rodriguez about life in Afghanistan but her first work of fiction. It follows on the heels of The Beauty School of Kabul: An American Woman Goes Behind The Veil, a memoir of her time there. Rodriguez went to Kabul as part of disaster relief efforts following the fall of the Taliban in 2002. While she was there she established a beauty school to provide employment and business opportunities to local women, ran a small coffee shop like the one in this book and married an Afghan. She also established Oasis Rescue, a not-for-profit organisation that continues the work of the Kabul Beauty School in Afghanistan, Iraq and other Middle Eastern countries. Following the success of her first book in 2007, Rodriguez was forced to flee Afghanistan after rumours surfaced of a plot to kidnap her son in order to extort money from her. She’s an inspiring woman who is doing good things for other women. Would you like to read The Little Coffee Shop of Kabul? I really enjoyed this story as well because of the way it portrayed the life of the afghani women against the lives of their foreigner friends. I felt that it gave a real insight into how precious the culture in Afghanistan is to people but at the same time so disrespectful towards women. Thanks for your comment - great to hear you enjoyed the book. I really enjoyed this book too! I thought that having some Western characters made it more accessible to readers, without taking away from the cultural experience. Thanks for your comment, I will check out your blog. This has been a wonderful read. I found myself completey immersed in another world and felt as though I came to know the characters of this story intimately.